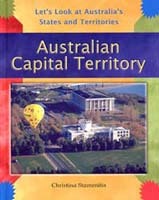 Each book in the Let's Look at Australia's States and Territories series provides a range of information on a particular state or territory. There are maps as well as lots of colour photographs supporting the information. The Austalian Capital Territory (ACT) is a territory in Australia. It is the only inland territory of Australia.